I spend much of today napping, which was a good start. 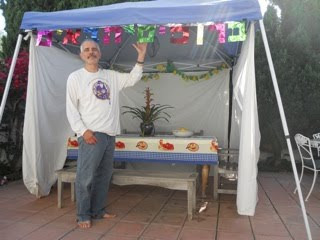 But I will try to have dinner in the Sukkot. We were scheduled to see Tom Petty and ZZ Top tonight in Chula Vista, a few hours away, but they cancelled the show at the last minute, which was a good thing. I would have been dragging going to a concert tonight. Or full of regret zz-ing (sleeping)at home instead. Starting Cancer Ward by Aleksandr Solzhenitsyn. Arrived back home at 1:30 PM and was on a teleconference at 1:31 PM on anemia. Actually the waiting lounge and the flight was the perfect setting to prepare for the call. The Lymphoma conference in SF was very clarifying and the visit with my daughter and son-in-law was the best. Great vegan food and perfect weather too. Give me a day or two to organize my notes and my brain, and I will share my thoughts about CLL, transplants, and lymphoma in general, and how they apply to me in particular. I also promise to throw in a few restaurant tips. I would like to report they have found a cure for CLL. I would like to report that, but that would be just my wishful thinking. What I can say is that the science is moving forward, the targets more clearly delineated, and the meds in the pipeline smarter. I just wish the pipeline was way shorter. I am much too tired and my brain is overflowing, so the details will need to wait until I return. What I will mention is what a fine organic vegan meal we had overlooking the bay. Tomorrow my brain gets stuffed again. Topics include transplants and meds that interrupt critical cell pathways. Good stuff. And another great vegan meal at day's end. Isn't it weird how Chronic lymphocytic leukemia is part of a lymphoma conference? I know the rationale, having to do with its lymphocyte roots like its fellow lymphomas, but it is still weird. Regardless, it will be a chance to hear some of the latest research. Drs, Kipps and O"Brien are top notch CLL researchers and clinicians, very much thought leaders in pushing for new and better therapies. They can see further into the future that the rest of us. They are optimistic. Reason enough to go. And a chance to renew contacts and make new friends. And it is in San Fran so who can argue with that. Great city, Great vegan foods, A choice of raw restaurants. I remember my 1st lymphoma conference where I spent time with Dr Rai in the hotel lobby in Los Angeles. Seems so long ago. I was sure I would beat this with the shear power of my will and intellect and a clean diet. And maybe a little traditional Chinese medicine thrown in. My destination remains the same, to live to see my unborn grandchildren grow up. It is only my route to get there keeps changing. Will I see you at the conference? Look me up, especially if we have talked or corresponded over these last tumultuous five years. attendees. Space is limited so please remember to register early. What is a Clinical Trial and is it Right for me? Note: Dinner is not provided as part of the program. Transplant Survivorship – Now What? I have a sore bottom (actually the posterior superior iliac spine) from my bone marrow biopsy today. For the squeamish, I won't go into the details, but let's just say it was not easy to get the core specimen. But the nice PA stuck with it long enough to recover good samples for the aspirate and and a 1 cm core for the biopsy. Much better than last time when the core specimen was crushed and pretty useless, so this time my results should be much more precise. It was harder on her than me. The lidocaine takes away most of the pain, but they can't numb bone, and the feeling of having your marrow sucked into a syringe is not something I would wish on anyone. Still I need to know and it really wasn't that bad. Honest. My blood tests done at the same time at UCSD were great. Platelets were at the wonderful level of over 380,000. More that 380,000! Not bad for a kid with ITP. Rest of the blood count and chemistries were all great, but my BP is up (140/74) again. I will consult my FP tomorrow about adding a medication. My blood pressure was great off all meds until I started on the cyclosporin and by tomorrow I will be on three drugs to lower it. But it is worth it, especially when I get the good news on the biopsy, Work your magic, cyclosporin! We stopped in Leucadia at the Greenery Cafe on the way home where I enjoyed an amazingly satisfying raw organic vegan lunch of the world's best raw vegan burger on a raw vegan bun with raw mustard and raw ketchup. RAW RAW. Now if the can only find a way to make raw fries. This evening I went to a Mastro's, an upscale steak house (I had a very dull vegan pasta, so it was a complete waste on me) to hear a friend and his partner give two excellent CME lectures on vitrious and retinal surgery and new treatments. Sat with a remarkable scientist from NASA. He and I were the only ones in the room who weren't eye surgeons. He was there because he had done some of the critical research that made the new meds and surgery possible. I just listened. It is good to stretch your mind, go outside your area of comfort. Tomorrow, dinner in the Sukkot. Life is sweet, even with a sore bottom. AlloStim: The Promise of a Painless Cure? I have asked to comment on the inventive AlloStim from the very creative and very smart Israeli company: Immunovative Therapies. It is very promising, very important work they are doing. What they are trying for is cherry picking all the ups of a transplant without any of the downs. The are searching for nothing less than the holy grail of immune therapy, namely powerful graft versus tumor effects without the terrible graft versus host issues or the dangers of immune suppression. And what if you are one of the many who doesn't have a good HLA match. AlloStim may be your only choice. The purpose of this blog is not to review new therapies for CLL. I suggest instead the excellent work of my friends, Chaya Venkat at http://updates.clltopics.org/ or Chris at http://cllcanada.ca/2010/index.htm. You will find good research and balanced reviews. However, as I was specifically requested a few times to comment on this research, I will respond. My take is that while AlloStim may be the future, it is not proven yet to be the present. Is it worth considering one of their trials? Depends on your circumstances, but yes is my short answer. My big concern is their mission is to recharge our own immune system to do the heavy lifting, and I worry that is flogging a lame horse. CLL is a cancer of the immune system. My bigger wish is they have figured out a way to surmount that obstacle. I am not convinced. Not yet. I do wish them G-d's speed. An internet friend with CLL and and a MD degree like me wrote to ask: so what is your plan? This is my answer. Notice how it is all about CLL. ITP is for now in the background. Staying on cyclosporine (CSP), but I am hoping to reduce the dose when I finish most of my travels in early Dec. I am planning more rituximab, but my bone marrow biopsy (BMB) is first, this Wednesday with Kipps. Clearly the response to rituximab is dose related. I would prefer to get 2,250 mg/M2 in a single dose as was done in O'Brien's trial of mono therapy, but short of that I will get 6 weeks of 375mg/M2. Clearly I am sensitive to it in combo with CSP. If all stays good, then repeat another 6 weeks of R, than a CT and BMB 2 months later, so about in 6 months. If my nodes are down more, just stay on a lower dose of CSP, and then probably FCR or BR to get a deeper remission and to wipe out the T cells and immediately onto transplant- likely using the same donor or one of his sibs if they agree and match. I have no other good options at this time. Likely at City of Hope (CoH) again. If they are bigger, maybe lenalidamide + R or O to shrink them, then FCR or BR, then transplant. I will see what Dr. Kanti Ray says when I see him in November. He likes DCR and that might also figure in. I know Kipps is against more R, and Forman at CoH and my local oncologist like it. My concern is that I need to go to transplant with as little disease as possible, and definitely with nodes less than 5 cm. Frankly, I don't see anything that is going to significantly help younger patients like us getting into our hands in the next few years, so I don't buy this treating CLL as a chronic disease patter from Furman and Kipps. Your plan makes a lot of sense. I had planned to proceed to HSCT when the time came (I have a good match), but lately have felt a bit more reticent, given my horrendous journey after attempting FCR and the poor course of several people who have been posting about their recent transplants. I really don't know what I'll do when push comes to shove...my upcoming CT scan may influence how I proceed. My biggest concern is lack of data showing fantastic results beyond 2 or 3 years (or am I missing something?). If the upside were higher (more certainty of cure if you hurdle the first few months) I think that I'd be more certain of which path to take. There are no great answers. A significant minority of transplants patients seem to do very well long term. The mortality curve is pretty shallow, but not flat after 5 years. Seems the important thing is try to join that select group by improving your odds going in: low disease burden, no co-morbid issues, and a good match. On the other side without transplant, even if you get all the best therapies and pick the right trials, almost no-one with 11q does well after 7 years or so, especially if you are unmutated. Maybe that will change, but it hasn't yet. For now. It could of course all change on a shekel. More R, then more real chemotherapy as needed to get disease way down and beat back my T cells then a redo transplant next summer. Engraftment. DLIs as needed. GVL, GVHD, but manageable. GVHD burns out after a year or so. Vigilance forever. Big party on my 95th birthday. I have been slower than my usual tortoise pace since my 25 hour fast for Yom Kippur. I wore no leather, did not anoint myself, had no "familial relations", skipped a shower, ate nothing, but I did drink water. That morning I had my CT scan of my abdomen and the barium in my gut and more importantly the IV contrast iodine in my fragile kidneys needed to be purged so I drank lots of water. After all the Talmud teaches we are to live by the commandments, not die by them. But the not eating and the long hours in the shul, pounding my chest for my sins, doing the hard work of repentance, took its toll and I have still not fully recovered. So did the CT scan tell whether on this day of judgement would I be one of those inscribed and sealed in the Book of Life for a year of peace and health and prosperity? It was indeed like cracking open a fortune cookie and reading the note inside that foretells my future. And like any good fortune cookie, the news was generically good, but non-specific. After being on a manly dose of cyclosporin (that has raised my blood pressure, strained my kidneys and put me at risk for gout) for almost 4 months, and having had 6 weekly doses of rituximab that finished more than 2 months, there was only one question we were trying to answer. Was my cancer retreating? The CT says YES. Big time. My largest cluster of mesenteric nodes had shrunk in volume more than 80% from 6.4 cm x 3.4 to 3.8 cm x 1.7 from the CT on 6/1/10. The next large node is in the inguinal area and measures in at 2.2 cm. The rest have all shrunk or at worst stayed stable. Careful readers may be scratching their head. I thought you said your last CT was a year ago, and then the largest cluster was a mere 3 cm though I had suspected significant growth had occurred as my cancer was relapsing, making it hard to know what the findings from last Friday's scan would mean. But I had honestly, totally forgotten about my June 1st CT, a scan of all of me, a scan of my neck, chest, abdomen, and pelvis. Its memory was not to be found anywhere in my head, When the radiologist told me I had less disease than before I was thrilled and surprised. Less than the 3 cm a year ago. WHOA! Then I was confused as he was comparing my images to those just a 100+ days earlier. I struggled to get my bearing as I listened to his findings. In the preceding weeks, I had discussed with my doctors the difficultly of not having a measurement just before I started therapy to help gauge my response to therapy when in fact I did. They didn't question me. Only my wife tried to tell me she had a different recollection. I didn't listen (always a mistake) for she was again right. But the denial had served me well. I would have been so much more worried if I had been constantly conscious of my big gut notes. Their fate is my fate. I would have fretted and been down. Even more. So the reality altering full blown denial in my case turned out to be a healthy coping mechanism, not that I recommend the ostrich strategy to any of my readers facing a tough enemy. For me it bought me a few months of less fear. This result is very good news. My greater than 6 cm nodes were sensitive to pretty gentle treatments of rituximab and cyclosporin. Not an easy task for such light weight therapies. It was hardly a given, many would argue a most unlikely outcome. No-one would argue it is not a reason to celebrate. And I would add, to push on. In the next post I will deal with what the scan means in more detail. The picture is starting to get clearer. The path is straightening out. It is getting close to sundown, close to Kol Nidre, so this needs to be brief, but my weird therapy combo of immunotherapies, rituximab and cyclosporine, has worked again at shrinking my nodes, but there is more work to be done. All the numbers and details after Yom Kippur. And I promise a powerful surprise. It certainly surprised me. CT scans. I hate them. I hate how they slice me up like a salami every 5 mm and then use some mathematical wizardry to reconstruct my innards. What you get is shadows. What casts them is the different x-ray densities of the tissues being spied upon. It my case it is the mesenteric or gut nodes that will tell my story. The radiation exposure is considerable. Maybe equivalent to 400 chest x-ray, And since the belly is nearly always shot with and without contrast, the exposure is doubled. Hence my decision to forego the viewing pleasure of my chest and neck. The gut is where the action is or isn't. Why redouble my exposure for little more data? Some malfunctioning CT scans here in LA were delivering massive overdoses of x-rays, unbeknownst to patient and doctor alike. They weren't just imaging the cancer, they were frying it. More likely nudging it, tilting its already chaotic genetic balance to tumble down, who knows where. That however is not my worry. I avoid them become I become despondent in the weeks before despite my best efforts. I live now in the realm of all that is possible, including a miracle. On Friday, I sacrifice on the altar of science and the need to know, the infinitely plausible in order to tentatively grab at ,,,,, what? The reality of a fragile miracle happening in my gut and my marrow? A cancer saying goodbye? G-d willing! A confluence of bad boys covering each others' back like the worst street gang you ever saw? G-d forbid. A hint of remission or at least a significant retreat of my most persistent enemy in its favored hangout? Or no change? Or a tiny change or a little up or a little down or a little of both? Forget the radiation risks, the barium, the clear liquids, the weird flush feeling from the IV dyes that carry the risk of allergic reactions and renal damage. What bothers me is that it seems too prying, too invasive. It is the surrender of all possibilities that makes me hate CT scans. But I must march headlong into knowing. Even Moses, with G-d on his side, sent scouts ahead to check out Canaan. I am confident that I will get a better report than Moses. And although my ancestors did spend too long wandering the desert, largely as a result of their reaction to the spies' reports, we do know that they finally did enter the promised land. I will not wander from my goal. “Do not pursue what is illusory – property and position; all that is gained at the expense of your nerves decade after decade, and is confiscated in one fell night. Live with a steady superiority over life – don’t be afraid of misfortune, and do not yearn after happiness; it is, after all, all the same: the bitter doesn’t last forever, and the sweet never fills the cup to overflowing. One who is happy with his lot. Those ancient rabbis were very Zen. It is a guaranteed path to misery to compare yourself to those who appear to be more fortunate and happy. Rabbi Telushkin's mother said: "The only people that I know that are really happy are people that I don't know well." The Russian author quoted here also reminds us in his closing lines that love is all you need and life is not predictable or controllable. Please share your thoughts on happiness. Later this week, my CT scan. To say I wasn't apprehensive would be mendacious. To let its approach shatter my joy, would be wanton. Why borrow trouble? Rabbi Telushkin talked today on practical ways to be happy. Cultivate gratitude. Count your blessings. Forgive. Holding a grudge is like letting someone you hate take up residence in your brain rent free. Let it go. And remember to forgive yourself. Stay connected. It is not good to be alone. Charitable acts are our only assets that can never be taken from you, so let them grow. Jesus was right when he preached that is really better to give than to receive. I want to add from some others that have informed my life. "Remember things can go from the very worst to the very best in just a blink of an eye"
Linger over the smallest of pleasures because they are so common and much easier to find the ecstatic peaks. Focus on the sweet spots and move past the pain as quick as you can. Seek acts of joy over pleasant diversions, though it is quite OK to be superficial some of the time. Play music, look at art, dance, plant a garden. If you must, fake it until you make it.It helps you make it. It is not always easy to be happy but it always worth the effort.